Another Muslim hijaabi making us proud… And with such a profound message too! 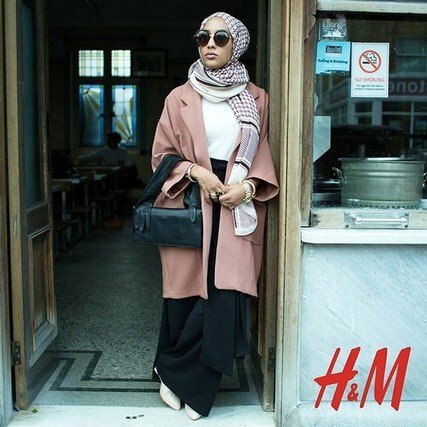 She (and the H&M hijaabi model pictured below) are getting a lot of press. “H&M has been largely applauded on social media, with one non-Muslim woman tweeting that she was “so happy that the gorgeous hijab-wearing fashionistas are being represented by a global brand”. And another social media favourite has been hijab-wearing Great British Bake Off (GBBO) contestant Nadiya Hussain, who has galvanised public support with her brilliant flavours, expressiveness and warmth, with many canvassing for “Nadiya as Bake Off queen”. Comments such as these indicate a much-needed shift in attitudes towards Muslim women. As a strongly politicised sign of religious identity, the hijab has been subject to a complex debate in recent years, with some viewing it as a feminist symbol of liberation, while others disdain it as a symbol of oppression. When I began to wear a headscarf, one friend split no hairs, telling me I was bending to “male enslavement”.